Hearth candelabra provide the warm ambiance of a fire without heat or mess,and are an elegant way to enliven your fireplace when it is not in use,particularly during summer months. Their compact,elegant designs make them equally suitable for tables or sideboards. With a hearth candelabrum your fireplace will remain the focal point of your room all year long. 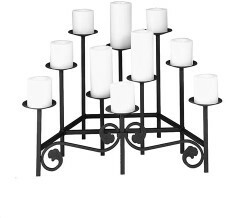 Leaf-tipped scrolls provide a base for this elegant three-tier candelabrum with eight candle-holders of varying heights. In Black. (Candles not included).